Thousands of barrels of bourbon are in storage in Anderson County. Wild Turkey sits along the Kentucky River on land with a rich bourbon history. Its Spanish-style architecture makes the Four Roses Distillery unique along Kentucky's rural countryside. An annual civil war reenactment is held each September in Lawrenceburg. Two rare bridges cross the Kentucky River adjacent to the Wild Turkey Distillery. The Anderson County Burgoo Festival celebrated 25 years in 2018. The Anderson County Courthouse is a favorite spot for photographers. 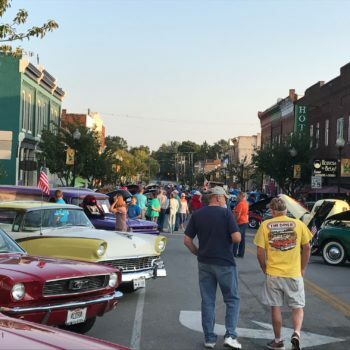 The Wheels of Time car club hold cruise-ins in downtown Lawrenceburg each month, April-October. 119 American flags fly high at the Healing Field. The Healing Field honors Kentucky service members killed in the War on Terror. The vineyard at Lovers Leap Winery provides a beautiful backdrop for visitors touring the grounds. Downtown Lawrenceburg has several shops and restaurants and is at the crossroads for travelers heading to the distilleries and wineries. Actor Matthew McConaughey serves as Wild Turkey's creative director. He made a surprise visit downtown in November 2018. People come from throughout the eastern United State to bungee jump off Young's High Bridge over the Kentucky River.